Bumps, a mind sharpening game created by Utopian Games for the iPhone, iPod Touch, and iPad has more going on than meets the eye. 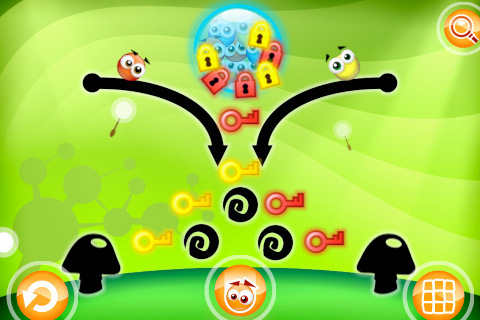 Several compelling elements make up the game: there are aliens that have locked up the majority of “cute, bubbly-eyed, bumps,” a species of round, colorful Earthlings; you are responsible for freeing them, your “captured friends;” lastly, in doing so you must work out strategies to attain all of the keys in each level. Capturing each key is necessary to unlock the energy bubble that the bumps are stored in, but it is difficult to acquire them in one run. To move your player you drag it across the screen to a designated spot that you think will best suite its course of action in collecting the keys. Once chosen, you push a button that causes your bump to drop from sky, thereby rolling up or down the ramp it has fallen upon. In what resembles a collision course, the bump will start a chain reaction, causing other, larger bumps to start moving towards the keys that need to be collected. When all is said and done, your are left with either the victory of unleashing your fellow bumps or a failed attempt, leaving them hostage. Many of the levels are easy to figure out within the first or second try, but others take long, steady concentration and an abundance of ventures. The levels are categorized by different landscapes like Floaty Meadow and Water of Wonder, each containing nine games. You can pick and choose what game you’d like to start with, but you cannot jump ahead to play unlocked landscapes. I appreciated the diversity this offered in graphics, scenery, music, and the different challenges each level offered depending on its landscape. Another fun feature is the award you get based on how many trials it takes to beat each level. If you succeed within the first two tries you’re rewarded a gold badge, a silver one if it takes up to four tries, and a bronze for anything exceeding five. One problem I had with the game was that my bump would get stuck at times. Instead of responding to my finger’s touch as I tried dragging the bump across the screen, it would stay in place, even after repeating the drag several times. The screen can be either too sensitive or not sensitive enough at times, creating some difficulty in controlling the outcome of the game. This little glitch aside, the game has no cause for complaint. It is cheap, stimulating, visually attractive, and a mental work out. For a game that is so skittish in appearance, it encompasses a distinctly mature concept–not only to free those who are endangered, but to figure out the physics behind doing so. All in all, Bumps is a wonderful outlet and is a big bang for your buck. AppSafari review of Bumps was written by Renata Paszterko on August 15th, 2010 and categorized under App Store, Featured, Games, Physics Based, Puzzler, Strategy. Page viewed 6297 times, 1 so far today. Need help on using these apps? Please read the Help Page.